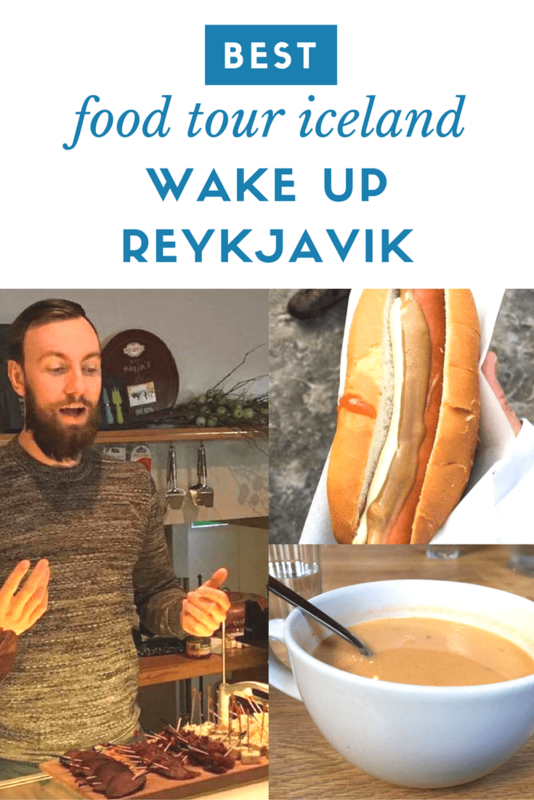 When I was in Iceland earlier this month, I had the privilege of taking my first ever food tour with Wake Up Reykjavik, a local food and beer tour company started by two friends, Daniel and Egill. While I knew we would be making six stops on the tour, I had no idea what to expect beyond that. After taking the tour with Daniel, I think I may be hooked on food tours and will want to eat my way through every city I visit. Not only did we have the opportunity to try some of the most delicious dishes in Iceland and visit local establishments, but we also got a tour of Reykjavik and learned about its history. Our tour began at Harpa, a large concert hall located a mere 10 minute walk from our hotel. We were provided with detailed meeting instructions via email beforehand and were told to look for Daniel, a man with a dark beard and blue eyes, wearing a bright orange coat and a backpack. With such a specific description, we had no trouble finding him. Before we left, Daniel explained that we would be trying some of his favorite Icelandic dishes on the tour and staying away from dishes such as fermented shark, which is undoubtedly an Icelandic delicacy but also has a strong taste that few enjoy. I was grateful for this as I had tried fermented shark on my first visit to Reykjavik in November 2015 and discovered that it is truly one of the most foul-tasting foods. Our first stop on the tour was Islenski Barinn, where we had a hearty bowl of lamb soup and a glass of cold Icelandic beer. The lamb was cooked to tender perfection and bursting with flavor. The lamb taste was mild enough that even those who don’t typically enjoy the taste of lamb could enjoy this dish. 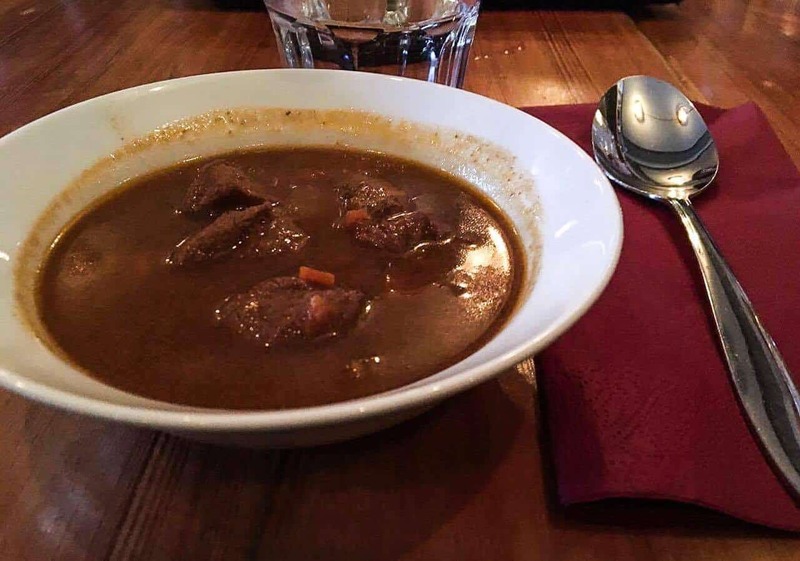 On a cold day in Reykjavik, I could hardly think of anything more appetizing than a bowl of lamb stew. To keep us hydrated, Daniel ordered us a round of Einstok White Ale, a light Icelandic beer with a crisp and refreshing taste that could only be created from the clear waters of Iceland. The beer provided an excellent contrast to the hearty lamb soup. 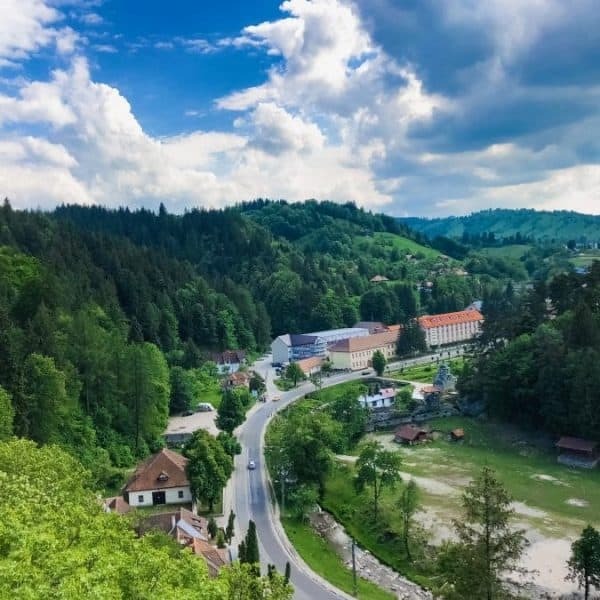 I felt extremely satisfied after our first stop and started to become a bit concerned about how I would fit in five more stops of delicious and hearty food. Luckily our second tasting consisted of some lighter bites that gave us a chance to digest our meal from Islenski Barinn. While lighter in portion size, Ostabudin did not skimp on flavor. Here we had the opportunity of tasting three cheeses and three meats native to Iceland. Although I am not a big cheese person, I tried all three types of cheeses and was pleasantly surprised by how much I enjoyed each one. Daniel prepared for us a black gouda, a golden cheese (similar to brie), and a blue mold cheese (similar to bleu cheese). All three cheeses were packed with flavor and very different from the cheeses I typically have in the states, such as parmesan or mozzarella. The first type of meat we were given to taste was a cured lamb, which I thought was incredibly tasty. The texture on this meat may be difficult to stomach if you are not a fan of rare meats, as it was rather chewy and extremely flavorful. The second type of meat looked similar to the cured lamb, but Daniel revealed to us that it was actually cured horse meat. My mind immediately flashed to the adorable miniature Icelandic horses I loved so dearly, but I erased that image and forced myself to try a bite of it. When in Rome, right? The taste was not bad, and I am very glad I tried it, but I’m not sure I’ll be eating horse meat again, as I can’t seem to fully forget the adorable Icelandic horses. Finally, we were given a bit of arctic goose to try with an Icelandic raspberry sauce on top. This was delicious, and I would love to eat more of it next time I visit Iceland. After we left Ostabudin, Daniel took us across the street to an insignificant looking building. Looks can be deceiving, however, as Daniel revealed to us that this was the site of the former Reykjavik prison, with a nightclub on the top floor. I had a hard time picturing myself having a drink and dancing above a prison, but others in the group thought nothing of it. From there, we kept walking up the street toward Hallgrimskirkja, the iconic church in Reykjavik. Across the street from Hallgrimskirkja is a little café called Café Loki, which is known for its rye bread ice cream. While rye bread and ice cream are both delicious on their own, they don’t come to mind as the most obvious combination for a dessert. In fact, rye bread ice cream was created as a mistake, when the owner accidentally made too much rye bread, decided to mix it with ice cream, and realized how delicious it tasted. I was blown away by how tasty rye bread ice cream is and would highly recommend making a stop at Café Loki to try this. Although other restaurants have attempted to recreate this unique dessert, none have succeeded. Café Loki remains the only restaurant in Iceland – and perhaps the world – that serves delicious rye bread ice cream. After our ice cream tasting, Daniel generously offered to order us a round of hot chocolates to take with us as we continued our tour outside. The hot chocolate was just the thing I needed on a cold March day in Iceland while exploring the city by foot. Our next stop on the food walk was the large pond in the center of Reykjavik. The pond was mostly frozen over, and we saw some people playing on the ice. I wondered what we would be doing there as I did not see any restaurants nearby. That’s when Daniel pulled out a Skyr yogurt from his backpack and told us that Skyr is one of the most basic foundations of an Icelandic diet. Icelandic yogurt tastes similar to Greek yogurt and has a bit of a sour taste without any added flavoring. Daniel brought one cup of plain Skyr for us to try and gave each of us our own flavored Skyr yogurt. By this point, I was starting to get quite full, so my boyfriend and I were happy to split one cup of yogurt between the two of us. While eating our Skyr yogurts, Daniel continued to lead us through Reykjavik toward Austurvöllur Square, a public square and popular meeting place where Icelanders go to have lunch on a nice day, or more seriously, hold protests. One such protest occurred in 1949 when Iceland joined NATO and police used teargas to dispel the rioters. Not far from Austurvöllur Square is Bæjarins Betzu Pylsur, a food stand famous for its hot dogs. 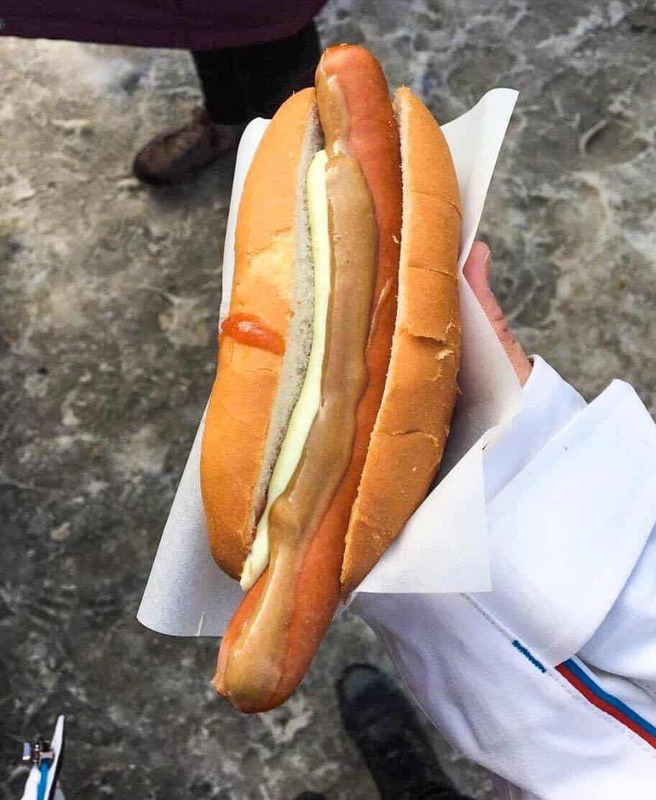 Traditional Icelandic hot dogs come loaded with onions, ketchup, brown mustard, and remoulade (a mayo-like sauce). To order this, simply say “ein með öllu,” which means everything on it. Many famous people, including Bill Clinton, have eaten here and become big fans. Personally, I did not find the “ein með öllu” hot dog to be exceptional. The bun was not toasted, the hot dog was quite plain, and the sauces were not particularly flavorful. This isn’t to say it didn’t taste good – it did – but it did not live up to its hype. Out of all the dishes on the food tour, I was least impressed with the Icelandic hot dog. Next, we headed toward the wharf, and Daniel led us inside a restaurant called Saegreifinn, or “The Sea Baron,” which I had actually visited with my family the first time I was in Iceland back in November 2015. 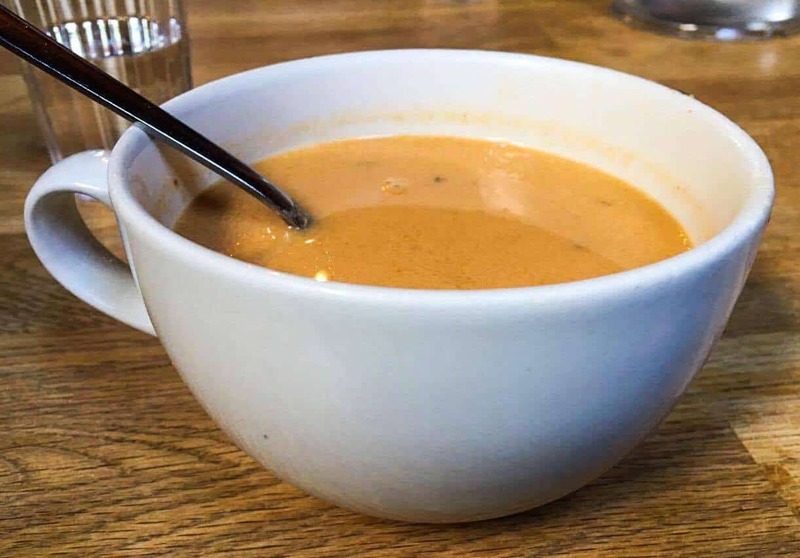 Saegreifinn is known for its lobster soup, and, unlike the Icelandic hot dog, completely lived up to its hype. The lobster was extremely tender, and the bisque was bursting with flavor without being overwhelming. I was particularly impressed with the thoughtfulness and hospitality of Wake Up Reykjavik at this stop. I had previously notified the team at Wake Up Reykjavik that my boyfriend has a shellfish allergy, so Daniel went out of his way to offer alternative dishes for my boyfriend since he was unable to consume the lobster soup. While my boyfriend would have been perfectly fine sitting out one stop, it is obvious that Wake Up Reykjavik truly cares about each of its customers. My boyfriend ended up with a salmon dish that was cooked to perfection. Our final stop on the food tour consisted of another tasty dessert. This time Daniel took us to Apotek, a restaurant and cocktail bar near Austurvöllur Square. 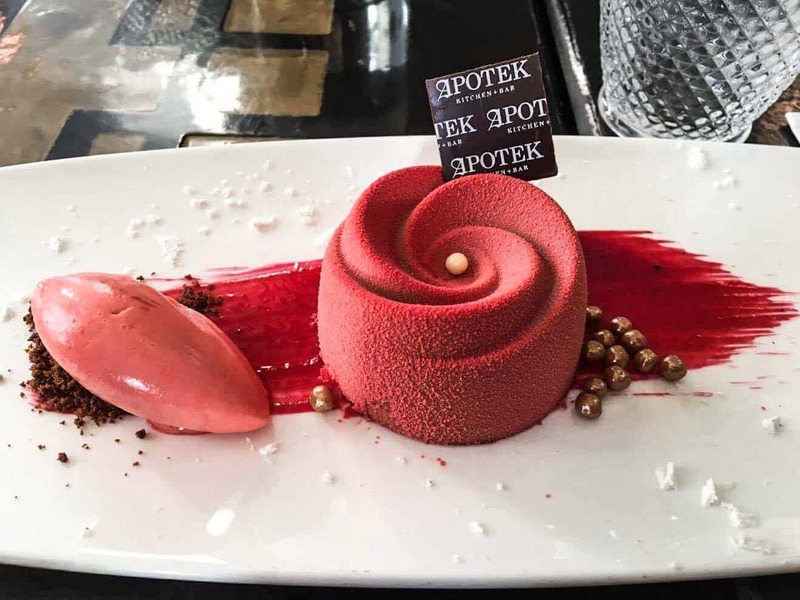 Here, we had a chocolate mousse rose with raspberry puree, raspberry sherbet, and chocolate crumble. This dessert was much heavier than the rye bread ice cream we had earlier in the day, and it was the perfect way to end the tour with a bang. 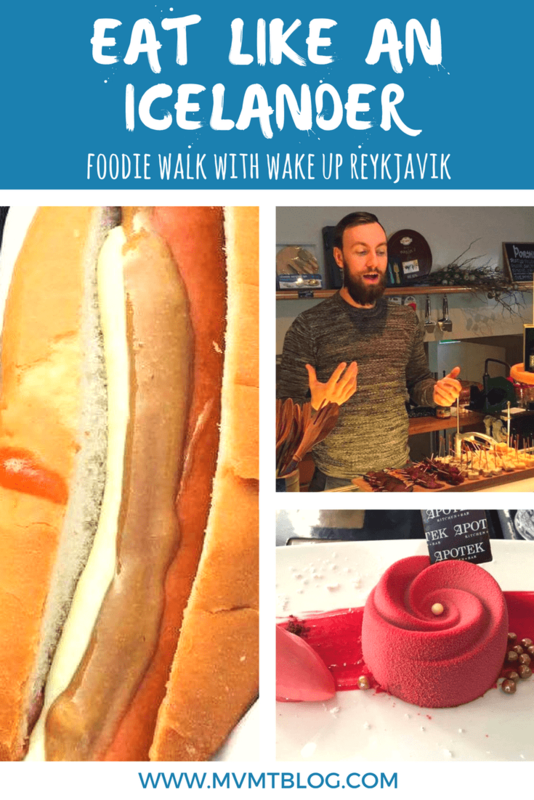 The food tour with Wake Up Reykjavik was the most delicious tour I’ve been on and the perfect way to spend an afternoon in Reykjavik. I would recommend booking the food tour on your first day in Reykjavik, as it will provide you with a good overview of Reykjavik and its history. The tour is appropriate for people of all ages and backgrounds. If you have any food allergies, be sure to notify the team at Wake Up Reykjavik ahead of time, and they will go to great lengths to accommodate. Also be sure to dress warm, as you will spend quite a bit of time walking around outside on this tour. 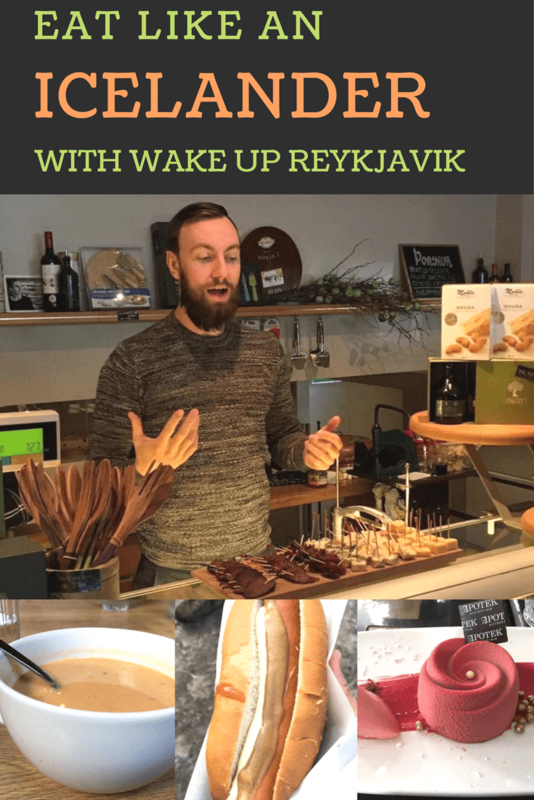 Click here to book a food tour with Wake Up Reykjavik, and be sure to book well in advance as these tours fill up fast! A big thank you to Wake Up Reykjavik for making this tour possible for us. As always, all opinions are 100% our own. Wow Iceland is attracting me more and more! I didn’t knwo that you could eat there so well. The Chocolate Rose Mousse Cake looks out of this world! A food tour?! What a cool concept. That hotdog looks insane. I don’t think I’ve ever heard of lobster soup before.. interesting that it’s known for that! Glad to hear it was good and that you enjoyed it. I’ll definitely try it when I visit. The lobster bisque was delicious, Christie! And the place to get it from is Saegreifinn. If you like to eat, I would highly recommend taking the food tour as soon as you get into Reykjavik – it’s basically good for two meals, so you’ll save money on that, and you get a free tour of the city while you’re at it. You know the company is organised when they gave such a detailed description of the man you had to meet, Daniel! No chance of missing him. I love brie so I’d love to try the golden cheese, how was the black gouda? I’ve heard good things about the skyr yoghurt, it’s actually cheaper here in the UK than it is in Iceland, I don’t know how that works! I am impressed you ate Hot Dogs in the same place Bill Clinton did! The black gouda was actually really good, and I’m not a cheese person at all. That’s crazy that Skyr is cheaper in the UK than in Iceland! It’s quite pricy in the US. I’d have to say the hot dog was the most overhyped food on the tour – still good but I was expecting a bit more given how much everyone raves about it. I totally love food tours. Your post made my mouth water! That chocolate rose mousse cake looks both beautiful and delicious! How was the rye bread ice cream?! I wanted to try it at Loki but ended up eating somewhere else instead. The rye bread ice cream was probably my favorite! It sounded really weird to me at first, but wow was it delicious. Would definitely recommend going back to Loki to try it next time you’re in Reykjavik! That looks like a great food tour, but so much food!! Not sure i could eat all that. I didn’t know that there was a food tour available when I was in Iceland, it would of been great to do. I have done a few food tours before and always really enjoyed trying the local dishes, its a great way to know a country even more. It was definitely a lot of food and covered both lunch and dinner for me that day! It was my first food tour and I am hooked. Would highly recommend doing the food tour in Reykjavik if you have the chance to go back! Nice to have met you on the tour Diana. Hi Steve, great to meet you too! This was one of the highlights of our trip as well, and we had a blast snorkeling. Always a good time in Iceland. Hope the rest of your trip was wonderful as well. 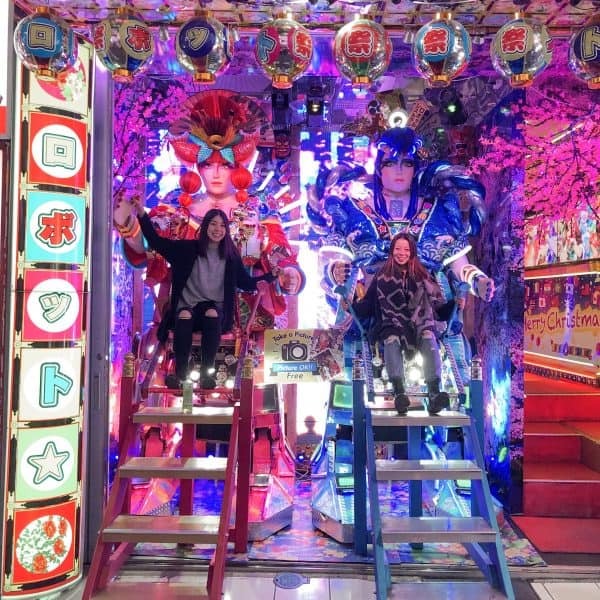 Looks like you had a great time on the food tour! That rye bread ice cream and lobster soup sound delicious! I’ve always thought of joining one, but could never justify paying someone to show me around when I could do my own research. 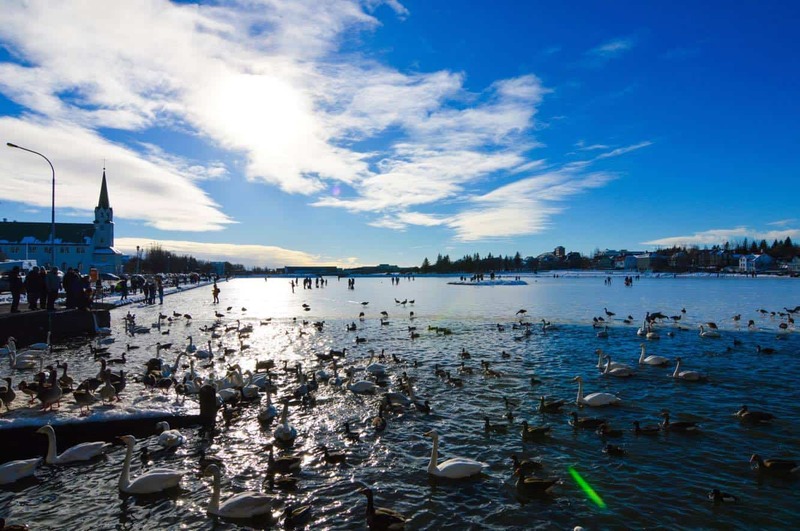 But seems like, besides the food, you got to learn about Reykjavik and its history – which is a big appeal to me. I totally know what you mean, but yes – it was a city tour and food tour in one! I also justified it because food in Reykjavik is so expensive that the food tour was actually worth it financially. We had so much food on the tour, I didn’t have to buy lunch or dinner that day. Pretty much covered food costs for an entire day for me. The rye bread ice cream was probably my favorite dish on the tour. It sounded so weird at first but once I took a bite I was hooked. Woahhh the food looks delicious. Specially Chocolate Rose Mousse Cake. I am definitely trying that whenever I visit Iceland. For me, one of the best parts of travelling is trying out new dishes and exploring the food scene. The rye bread ice-cream is a flavour I have never heard of before! Glad to hear that Wake Up Reykjavik caters to food allergies. This is something I would need on a food tour. Thanks for sharing! I totally agree, Riely! And I was very surprised and impressed with the way Wake Up Reykjavik catered to my boyfriend’s food allergies. We would’ve been perfectly happy just skipping that part of the tour, but they really went above and beyond to make sure every single person had a positive experience on the tour. It felt more like a private tour than a group tour in the sense that they catered to each person’s specific needs.